Temptation and Sin | You Can Shake the Gates! Temptation and Prayer – You Can Shake the Gates! One habit that Angela and I picked up when we moved to Papua New Guinea in the 1990’s was to always watch the path at our feet when we walked anywhere. 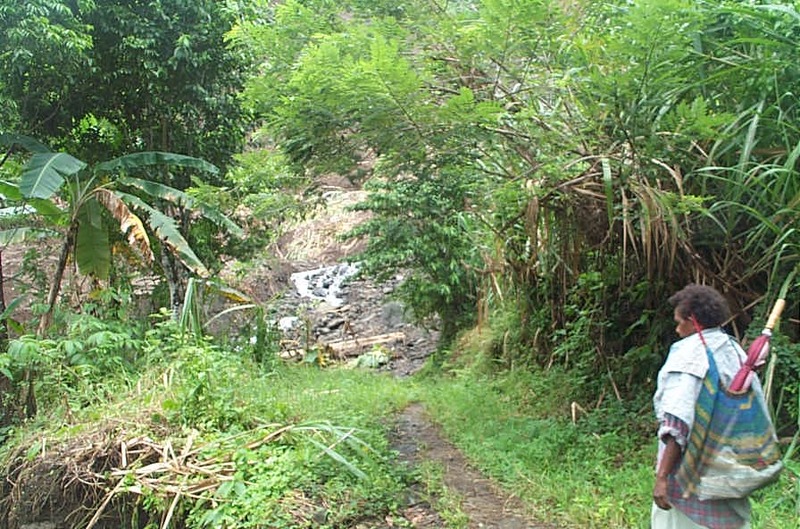 Paths in rural Papua New Guinea are not wide, cement sidewalks or elevated boardwalks through wet areas. Because we lived on a very steep-sided mountain, our paths were (and are) narrow, stony, slick, steep, and snaggy. A person tends to watch the path rather than looking around at all the scenery. The scenery is taken in when drinking water or sitting for a bit of a rest. Jesus’ followers watched him walk the snaggy paths of temptation. He handled people who hated him, doubted him, those who tried to manipulate and use him, and tried to try and trick him into doing something that they could use against him. The disciples watched him handle both popularity and rejection with unshakeable character—and without sin. On the other end of those three years he gave a similar directive—on the night he was betrayed. Entering the Garden of Gethsemane he instructed the disciples: “Pray that you will not fall into temptation.” Walking several yards further, he dealt with his own temptation in prayer. In prayer he chose to make the horrific journey to Golgotha. Returning to his followers, he found them sleeping, “exhausted with sorrow.” He knew what was about to happen. “Get up and pray so that you will not fall into temptation.” They would need to have been strengthened in prayer to endure the coming hours. Stress, fatigue, and sorrow can all take their toll on our ability to resist the temptation to fall into worry or anger or hate. Western culture cultivates these three realities. We are pushed to excess in all. It is a diabolical strategy to break us down and make us vulnerable to sin—to push us over the edge. Missionaries face these realities in a rather magnified way on a daily basis. How do we overcome, friends? “Pray that you will not fall into temptation.” Notice Jesus does not exhort his followers not to fall into sin. He exhorts them not to fall into temptation (the gateway to sin). There are three main sources of temptation: the world, the flesh, and the devil. As we live in the context of the world, within our own skin, and in an adversarial relationship with the devil, we must continually be in prayer. One of our ongoing prayers must be that we will not fall into temptation. If we find ourselves in the place of temptation when we are tired, stressed, and perhaps sorrowful, if we have not lived in an attitude of prayer, we are more likely give way to sin. How do we overcome? Go, sometimes alone and at other times with like-minded believers, to a solitary place of prayer. Determine not to leave that solitary place until you have surrendered your will to the will of the Father. Your flesh will oppose you. The world will oppose you. The devil will mock you. Don’t give in! Call on God to work his will in your life at the crisis point. Receive God’s grace and sufficiency to overcome. By God’s grace, by his Spirit, by his Word, by his power we will shake the gates of Hell! This entry was posted in Shake the Gates Press and tagged fellowship, grace, intercession, prayer, temptation. Bookmark the permalink.